Today we attempted to re-image Rik’s new Surface Pro 6 using the usual set of task sequences that we have configured for all of the PCs that are in use, and hit an issue. The task sequence failed (very quickly) with error 0x80070490. Looking at what was going on onscreen, it was obvious that the partitioning of the disk within the device was failing. Initially I assumed that it was driver related and so pulled down the Surface Pro 6 driver pack from Microsoft, added it to SCCM and updated the boot media to include appropriate drivers. This didn’t solve the issue however. Looking at the disk configuration, it became apparent that the disk number associated with the SSD within the Pro 6 was not the ‘0’ that I expected, but ‘2’ instead! It appears, following some reading that the ‘disk’ in this device, which is a 1TB drive, is actually two SSDs configured as a RAID 0 set, hence the disk number being ‘2’. Copying the task sequence that Rik wanted to use to deploy the OS and software to the device allowed us to modify the disk number that would be used to ‘2’, which allowed the task sequence to complete successfully. Use some conditional queries to determine whether we’re dealing with a Surface Pro which has two disks configured as RAID 0 and hence has a disk ‘2’. The latter is the more elegant method and means that I won’t need to keep even more task sequences around. Both are in the standard root\cimv2 namespace. The Surface Pro 6 1TB UEFI partitioning step should target disk 2 and the conditions should have ‘all’ rather than ‘none’ in the IF statement. Everyone installing Hyper-V servers is installing them as Server Core servers, right? I recently hit an issue configuring APC’s PowerChute Network Shutdown (PCNS) software on a Server Core installation of Windows Server 1809 (the most recent release of the semi-annual channel) whereby while the installation appeared to complete successfully, I could not communicate with the service to configure it post-installation. Once the firewall rules were updated, communication was restored and configuration could be completed from a browser running on another machine. We can’t add this account. 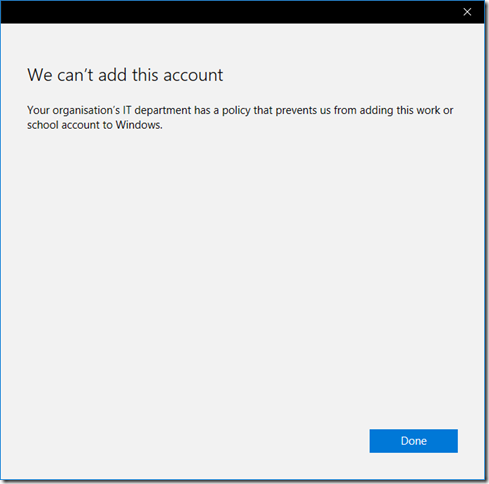 Your organisation’s IT department has a policy that prevents us from adding this work or school account to Windows. 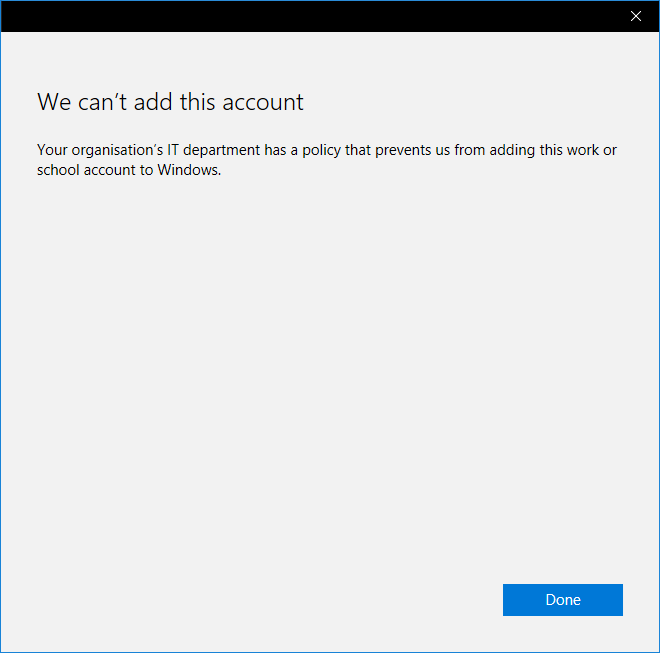 Initially we looked at whether recent policy changes had in fact impacted the ability to add a work account to a Windows 10 device, but were not seeing anything that appeared to impact this. We had other users who were receiving new PCs that were unaffected and had the same policies applied to them. In addition, nothing was showing up in the event viewer folder for Workplace Join on their machine when attempting to add the account. As can be seen, there are multiple instances of the ‘same’ machine. In each case, the machine has been reimaged and then had the work account added. In each case, Azure AD has obviously assigned a new device ID, hence what appears to be multiple copies of the same machine registered. Once we’d deleted a few of the ‘old’ machines from the list, the user was able to successfully add their work account to the device. Periodically check the number of devices registered and trim as appropriate. 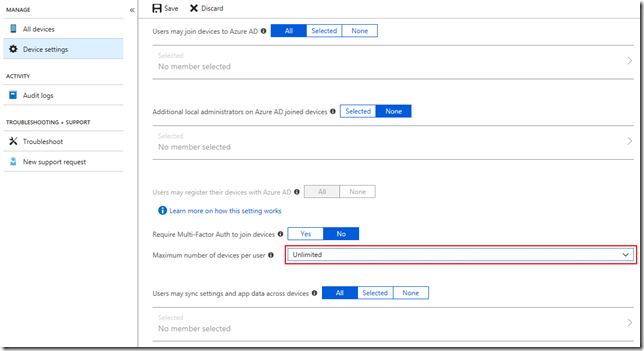 Raise the limit of the number of devices that can be registered, either to a larger number, or to ‘unlimited’ in the device settings area of Azure AD. I recently had a requirement to add a delegated administrator to DPM 2016. While it’s possible to configure self-service recovery, there doesn’t appear to be any way that I can configure another user to perform the delegated admin role as there is in some other System Center products. It is possible to configure another user to be a delegated DPM admin if you’re willing to roll up your sleeves and get a little grubby with the config however! Note that I’m fairly sure that doing this will impact support, but it’s easy to undo if required. There’s nothing in the DPM interface that appears to allow configuration of a delegated admin. Granting the user logon locally permissions still requires that the user elevates when launching the DPM console, so realistically they should be made a local admin on the DPM server. 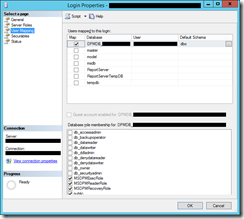 Grant the user local admin rights on the DPM server. I’d strongly suggest creating a dedicated admin account for the user rather than using their day-to-day account for this purpose. Create a new login for the account that will be used as a delegated admin. Right-click the new account and select ‘Properties’. Check that the user can a) log onto the DPM server and b) successfully launch the DPM admin console and administer the service. Design of SharePoint content Types for SharePoint, and in particular SharePoint Online is very important. Care must be taken to ensure that the design is appropriate for the environment as changes made later can impose significant management overheads. In particular, if a Content Type is put to use (I.e. is assigned to a list/library), this can complicate changes made at a point following initial deployment. Some Content Type operations are simple, e.g. adding a column. This will work as expected, with the new column rippling all the way down to the in-use Content Types. Renaming a Content Type potentially falls under the ‘more difficult’ category, in particular if it’s been assigned to a list/library. This is due to the way that SharePoint handles this process, with the Content Type that is assigned to the list/library being a child content type of that published to a site collection. I’d still strongly recommend using the Content Type Hub (hidden site collection, available on /sites/contenttypehub) to centrally manage and publish content types. A change to the name of a content type made here, then the content type being republished will rename the content type in the content type gallery in each site collection. If the content type is attached to a list/library however as this is a child content type, this will not be renamed, so you end up in the scenario that the gallery reflects the name change, while the instance attached to the list/library does not. Looking at the list of content types attached to a list/library, and clicking through on the content type that you wish to change does allow you to change the content type from read-only to writeable. This then allows you to change the content type’s name, however if you have lots of libraries and/or lots of content types to process, this gets laborious very quickly. PowerShell to the rescue again! We’ve detected that your user account password is not managed by Microsoft. As a result, we are unable to automatically reset your password. You will need to contact your admin or helpdesk for any further assistance. As we’d made no changes, we were obviously concerned! Ensured that the OS patch levels of the servers (Azure AD Connect, ADFS, WAP) were up-to-date, which they were. Upgraded Azure AD Connect to the most recent version. The version we were running was a little behind, but not significantly so. 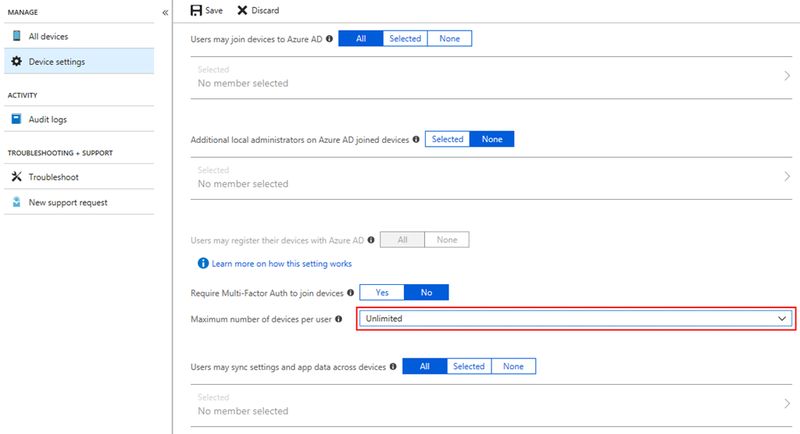 During the upgrade process, the wizard takes you through what you’d normally see if you reconfigure Azure AD Connect and select the ‘customize synchronization options’ task. The optional features selected were still the same as we’d picked the previous time we’d upgraded, and included ‘password writeback’. Unfortunately none of the steps taken above made any difference. Which, bearing in mind I’d just upgraded Azure AD Connect and been through the configuration wizard and seen that this option was ticked, should not as far as I was concerned be the case. Launched the configuration of Azure AD Connect and selected the ‘customize synchronization options’ task. When presented with the optional features configuration page of the wizard, unticked the ‘password writeback’ option and then completed the configuration. Checking the configuration page in the old Azure Portal again, the status of the ‘Password write back service’ is now ‘Configured’ and the correct SSPR prompts are again being displayed to users. Summary: A very useful volume that discusses what malware is, how to defend against it and how to remove it. Clear and simple instructions are given on ways to improve security on your PC, as well as how to deal with malware that may end up on your PC. Recommended. Presented in a very easy to read writing style, this book immediately appeals due to the clear, concise and no-nonsense approach taken when discussing malware, what it is, how it can attack and affect your PC, how to defend against it and what to do if the worst should happen and your PC gets infected. The first chapter provides a nice potted history of viruses and malware on PCs, discussing the various types and how both the proliferation and seriousness of infections has risen from the very first, typically benign examples to the modern day infections such as ransomware that has been in the news so much recently. Chapter 2 deals with prevention and defence, and introduces the many security features that are built into modern versions of Microsoft Windows to help stop the initial infection. There’s a clear progression in security features as newer versions of Windows have been introduced, and it’s interesting to compare the versions of Windows that were most susceptible to the recent ‘WannaCry’ ransomware attack. Looking at the features discussed (and having been to a few presentations on the subject), this provides an excellent set of reasons for an upgrade to Windows 10 if you’ve not already done so! This chapter also provides some information on blacklists and whitelists (I.e. internet filtering) and the Internet of Things (IoT). For both of these sections I feel that there’s perhaps been a bit of a lost opportunity, for example a brief discussion of the filtering options available might have been helpful for home users (e.g. my Netgear router at home comes complete with an OpenDNS-based filtering option that can be enabled and configured quickly and easily and seems to provide reasonable protection) and further information on IoT security recommendations, particularly changing the default username and password on devices would be beneficial here. Chapter 4 deals with identifying attacks starting with how malware infects a PC and providing pointers on how to identify both internal and external attacks. I was very pleased in this section to see information on social engineering and the role that this plays in malware infections. Chapter 5 provides a very useful list of external resources that can be utilised to help protect your PC and clean a malware infection, including the Microsoft Malware Protection Center, a great location for finding updates, additional security recommendations and products etc. This chapter also provides some limited information on third-party tools that are available. Again, I would have liked to see a more expansive list here, and it’s worth mentioning that many anti-virus vendors provide a free option of their products. Chapter 6 deals with manually removing malware, and for me this was probably the most useful part of this book. What do you do when malware has ended up on your PC despite your best efforts and you’re now having issues running the automated tools to get rid if it? This chapter helps in this scenario, and provides some steps to take to identify what’s running on the PC, suspend and/or kill the process and remove the infection. In particular I’m pleased to see the Microsoft Sysinternals tools discussed (albeit briefly) as they are my ‘go to’ toolset when dealing with an infection on a PC. If you’re interested in these and how they can be used, it’s worth looking at some of Mark Russinovich’s ‘Case of the Unexplained’ videos as Mark goes through the use of these tools in more detail. There are one or two downsides; the book is only a slim volume. This has both plusses and minuses insofar as being slim, more people are likely to read it end-to-end and therefore benefit the most from it, however in one or two areas a few more details might be appreciated. For such a slim volume, it’s also more expensive than I would hope for at an RRP of £14.99, which may limit its take-up. All in all however this is a very easily accessible book that provides great guidance on how to secure your PC, what to watch out for and how to deal with a malware infection. I’ll be encouraging a few people I know to buy a copy and read it!